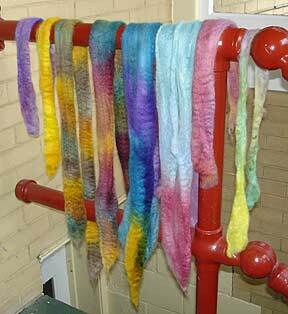 Yesterday Theresa came over and we spent the day dyeing up some wool! 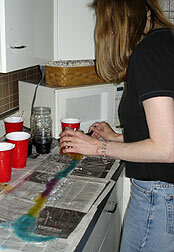 I am very haphazard and do-it-yourself in my dyeing method. Next time we are going to attempt to mix up stock solutions according to the "rules" so that we can get some repeatable colors. But here's how we did it yesterday. . .
No pictures of this, but what we did first was get our colors together. 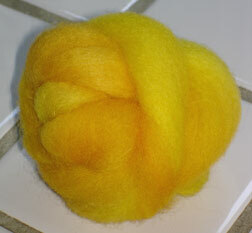 We used lanaset dyes, which I got from Sheep Hollow. They have a nice starter kit with 12 colors, which is what I purchased. You just mix the powder and boiling water -- easy as pie! First we soaked the roving. 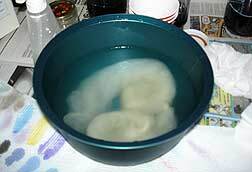 Last time I dyed, I used plain cold water, but this time I added a little vinegar to the water. (You can see our little color guide on the paper towel in the bottom left-hand corner.) Then you squeeze out the water. We found that the more water you squeezed out, the better. Then wrap up the roving in plastic wrap and. . .
Cook it! I have a big old enamel pot reserved for just this purpose (you wouldn't want to use it for food after this!) I put a brick in the bottom and a metal trivet thing on top. 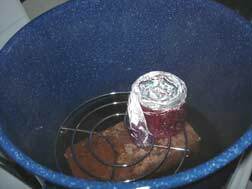 A couple of inches of water go in the bottom to create a bit of steam. Then the roving-buns sit on top. Cook until you finish eating lunch or whatever. Take the roving out and unwrap it. Then leave it to cool -- it's hard to be patient, but we had a lot going on to keep us occupied and it didn't take that long really. Then you just rinse out the roving gently in the sink. Squeeze out the water and . . . This morning the roving was completely dry and I pre-drafted it. 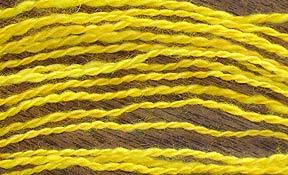 This bit of roving was dyed using patches of yellow and yellow-gold. And plied it. I made a two ply using the Andean Plying Bracelet method. Theresa showed me where I was going wrong and now that I have the hang of it -- I love it! Here's proof that you never know what you are going to get when dyeing. 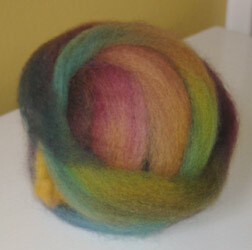 The first roving I dyed was done in green, navy, yellow-gold & magenta if I remember correctly. When I applied they dye I thought it looked terrible. But it went into the steamer and came out a completely different color. The magenta and yellow-gold gave me patches of pumpkin-y orange and the navy and magenta blended into violet. I can't wait to spin this one up! So that was our little dyeing experiment. I'm pretty happy with the results and the actual dyeing was a lot of fun. I see more of this in our future! Since I only knit 4 rows on Birch and 2-3 rows on my socks, I figure I'd just write about another knitting book. . .
Loop-d-Loop by Teva Durham. Wow! Now this is something new -- wild but many wearable designs. You can see a little slideshow on Durham's website. For the most part the designs are a bit out there for my taste, starting with Bobble U-Neck. Who wants to make or wear bobbles that big? But then you get something like the Ballet T-Shirt which is super simple but has some cool shaping. 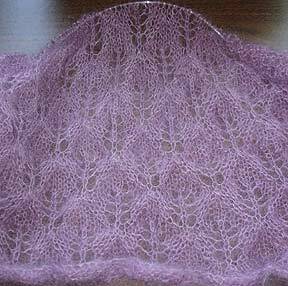 I also like the Lace Leaf Pullover (can't find a pic), although I believe it was available in an issue of Interweave Knits, maybe? I thought the Braided Neckpiece was super cool. And the Hooded Capelet is hot. (Did I say I liked a *capelet*?!?!?) It's got an almost tribal tatoo thing going with the lacework on the shoulder. All in all, I think the book is exciting (Bias Fair Isle Pullover!) and innovative. Durham is not afraid to go out on a limb (hence some of her ugly "neckpieces"), but she reels it back in and offers up some very nice designs along with the crazy ones. And you have to love the multiple color photos of each design. Very nice photography. Now maybe I'll get some knitting done tonight so I can stop yapping about books! Did you ever go to your hairstylist, sit down, discuss your hair color and end up with highlights? Now, I've had highlights before and I always hated them. Yet every couple of years I think, ya know, I should really get me some highlights. Blah! I guess I was in just this state of mind last time I went to the salon. 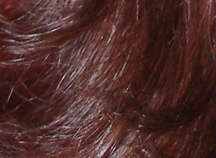 I came out $100 poorer, with blonde hightlights in my dark auburn (which was dyed a very blah brown) hair. Now I usually color my own hair and after an experience like this I remember why. (Yep, that's my actual hair.) I like it! And best of all, it only cost $6.99! Never Let Me Go by Kazuo Ishiguro. This book has gotten a lot of hype and I actaully think it lives up to the press. There's an eerie and almost beautiful contrast between the drama of the daily lives of the characters and the overall issue of human cloning and its terrible consequences. Read it -- it will get you thinking. Now I'm reading A Changed Man by Francine Prose. It's about a skinhead who goes over to the other side. Very interesting so far! Sarah Dallas Knitting -- Oh, I just did a bit of searching and found pictures here. Cute stuff in there and a nice variety! Vogue Knitting Stitchionary -- This book is supposed to have 300 stitches with lots of charts and color photos. Sound like a good source book. The Knitting Experience: Book 3: Color by Sally Melville -- I love the first two, so I can't wait to see this one. And if you are a new knitter, or want to turn someone into a knitter, I highly recommend The Knit Stitch . It has great photos, easy projects and lots of helpful hints. Those are the new knitting books that I'm interested in. Do you know of any knitting books coming out soon that look interesting? I'm always on the lookout for good knitting books! Know what that number is? It's how much I weighed this morning when I got on the scale. You will have a chance to vote on how long you think it will take me to get down to 130, but first a little about my weight. This is a touchy subject for women and I'm no exception, but I'm getting rid of the stigma of the number that is my weight. I mean, even at Weight Watchers you go in a little booth so that no one can see what this number is. The nurse at the doctor's office rarely ever whispers it. Why? I say, it's time to get it out in the open. So, here's my story. I went through a life. . . what shall we call it? change is too nice a word. Less than two months after my wedding, my dad dies of a sudden heart attack at the age of 49. Yep, 49. So, within about a year I quit my job, started grad school full time, got married, had my dad die, got pregnant, bought a house, moved and had a baby. Tough year. So is this my excuse for stepping on the scale a year later and finding that I weighed 176 lbs? Maybe, but I believe that I control my own destiny. So I decided it was time to wake up and take control. I lost 10 lbs and then joined Weight Watchers, knowing that at that point, if I didn't do something structured, the 10 lbs would probably sneak back on. And join Weight Watcher's, I did. I went to the meetings, bought an eliptical machine and got to work. In about 5 months I took off another 40 lbs, for a total of 50 lbs. I was 125 and looking a bit thin. Now, I'm not a little woman. I'm 5'6", I have what I like to refer to as "German farm girl legs" and I work out daily. So, I wil never be 115 lbs. In fact, when I started this whole thing my dream was to be 150. The reality is that 130 lbs is probably about the right thing for me at this point in my life. How many weeks will it take me to lose 6 lbs? Now I'm sure that some of you will look at my weight and think it's high, other's will think it's low. I guess it's all relative. Heck post your weight in the comments or on your blog. It's kinda liberating! Kathy! Thank you Kathy! I love the logo. There's something about it that is just me. And thank you so much to everyone who entered! There were so many great logos to choose from, that it was really a difficult decision. I've also been working on a sock, but I'll spare you the boring shot of my pathetic progress on sock #1. Thanks to everyone who submitted a logo! I received some great ones and I'm going to try to list all of the entries here. Aren't they great? I kind of have a favorite, but I'm going to announce the winner on Monday. Feel free to leave comments to help me make my decision. Wow! I'm getting lots of great entries already! Since I've gotten several repeat questions, I'll try to answer here. Deadline -- End of the week. I'm hoping to post pictures of some or all of the entries on my blog on Friday, so if you can get them in by Thursday, that would be great. Format -- Digital of some sort. Something like a jpg. Orientation -- I'm open, but I would like something horizontal for the bottom of the pattern. Hmmmm. . . I think that about covers it. I just want to say THANK YOU! to everyone who has entered so far. It's so cool that you would take time to work up a logo for me! I wish that you could all win, but I'll have to choose one. And I will chose the winner on Monday. Thanks again & keep those logos coming! 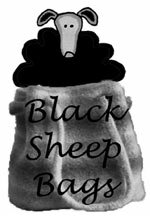 Black Sheep Bags Logo Contest! 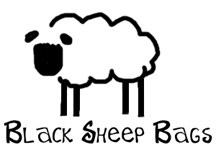 I'm desperate for a logo for Black Sheep Bags. I've tried to come up with something, but it's just not my thing. Here's what you could win! A selection of Black Sheep Bags patterns. It should be black and white, so it can easily be printed on the patterns. Here are the "rules". . . If you win, I will use the logo on my patterns, website and other things. I will need to have the rights to the logo. I'll probably post some or all of the entries here on my website. Please send me the logo in a useful format -- jpg or something like that. I think that's it! You can see the pathetic logo I'm using on my patterns here. If there are some lawyers out there that can think of something I've forgotten, let me know. The fine print. . . The "prize" will only be awarded if I pick a winner. So, if I don't get any entires, or I don't get any that I can use, I won't just randomly draw a name. You guys are creative though, so I'm sure I'll get something good!! I think that's it! You can see the pathetic logo I'm using on my patterns here. If there are some lawyers out there that can thing of something I've forgotten, let me know. I just finished reading two books. First up, I'm Not the New Me by Wendy McClure. Very funny yet cynical look at her own weight struggle. If you're a blogger, you'll enjoy seeing how McClure starts a blog to start writing about her weight loss. Her interest in her blog goes up and down as things happen in her life. She also talks about her "fans" who write her. I thought it was interesting and could really relate to both her weight issues and her blogging issues. She's also from Chicago, which is very cool. Check it out! And I started and finished Embroideries by Marjane Satrapi in one night. Yeah, yeah. I know I go on and on about her, but I think she's great! Just started Never Let Me Go by Kazuo Ishiguro. This book has gotten a lot of attention and I can see why. I could hardly put it down last night even as my eyes kept closing while I continued to try to read. More later. 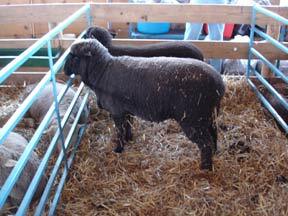 . .
A couple of years ago I went up to Michigan Fiber Fest and got to experience my first Cormo. Yum! So when I saw the Cormo booth, I knew that I was going to be making some purchases. 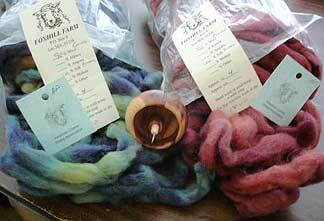 I showed some restraint and only bought two small bags of roving from Foxhill Farm. They are both 90% Cormo and 10% Tussah Silk. And that's spindle #2! It's a Bosworth Midi but it's lightweight (like a mini) because it's made out of Red Cedar. (It smells as great as it looks!) 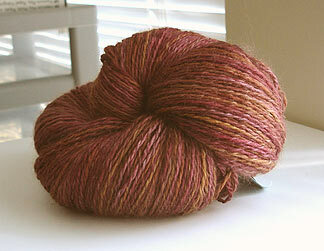 And it should be perfect for spinning the Cormo/Angora blend that I have had sitting around for awhile. I was spinning it on my Kundert, but it was just too heavy for the soft, slippery roving and I was getting singles that were *really* thin. More from the suitcase later. . . 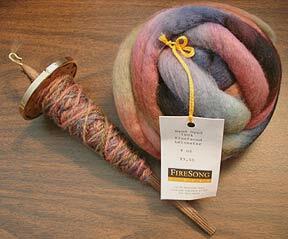 It's a gorgeous hand dyed Bluefaced Leicester roving from FireSong Fibers. (Oh no! They don't have a website, but here's a phone# 301-854-4848.) My idea was to make a 2-ply that was a subtly verigated but somewhat solidish color. I saw Claudia ply a bit last weekend using the Andean plying method and it looked easy. Oy! Note to self, don't try a new technique with a whole spindleful of fiber. Try it out using a few yards next time! Oooh, good things out there. I was using the Spin It! book which is a good reference to have around. In the end, I think the 3 ply is more subtle than I tought it would be and I'm happy with it. I believe that I'll spin up the rest and make some mittens. I leave you today with a close up of another MS&W purchase. 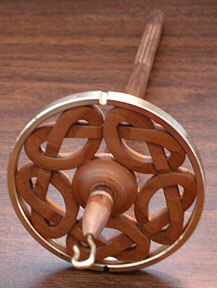 My Golding Ring Spindle. It's a 3" Celtic Ring carved out of Cherry. This may be my favorite purchase. It spins beautifully and looks beautiful too! I had a great time at my local knitting guild -- the Heritage Corridor Knitting Guild -- last night. 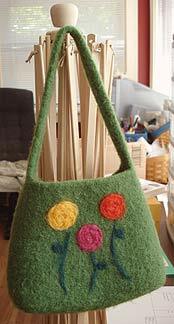 Fun women, a little knitting and a lot of needle felting. . . I'm happy with my first project. It's a Sophie that I knit up a little while ago, embellished with some whimsical flowers (hopefully you can tell that they are flowers, even through they are rather abstract :) Deanna Donovan from kneatles.com taught the workshop and it was a lot of fun and easier than I thought. I'm afraid no felted bag will be safe now! Speaking of the knitting guild, officer elections are next month. While I am pretty swamped with everything else I do, I'm thinking of becoming an officer (if they will have me!) Right Now Marianne (of Perfect Touch Yarns, my *very* local yarn shop) is doing the work of all the officers. If she keeps one office, I take one and Cathy takes the other, it may be doable. (I need you to help me though Cathy!!) We shall see what next month's meeting holds. Tales from the Suitacase! 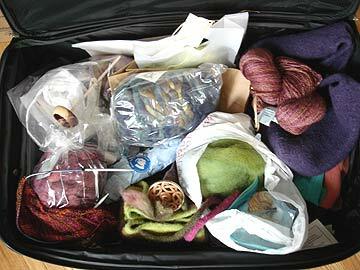 I reached into the suitcase and pulled out this lovely hank of yarn. 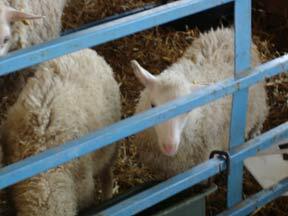 It's Harmony from Brooks Farm. This stuff is really lovely -- 55% kid mohair, 22.5% fine wool & 22.5% silk. I have no idea what colorway it is, but I'm in love! More tales from the suitcase in upcoming posts. If I don't document it all here, I'll forget where I got everything from! I did have a great time though. Theresa was a great traveling companion. And Silvia and Claudia were great fun and very sweet to chauffeur us around. I could start listing all the people that I met this weekend, but where do I start! And I get so confused when trying to match blogs to people. It was great to meet all of you!! I bought a couple of spindles, tons of fiber and a bit of yarn plus some other stuff. Once I sort through it all, I'll try to post more photos. Work has really piled up and I have a Knitting Guild meeting tonight, so I have to run. More tomorrow hopefully! Time for some fiber therapy in Maryland! Maybe I'll see you there! Well, I've been making patterns and installing a new toilet (more on that another day), so no knitting has been done. I haven't knit in so many days that I actually feel weird about it. Usually I knit every day, so this is a big deal. However, I have done some reading & finished a few books off of my 2005 realing list, so I thought I'd write a bit about them. First up, Hominids by Robert J. Sawyer. I decided to read this book because it won the Hugo Award in 2003. Don't let that fool you, it's not your typical spaceship type sci-fi. It's a parallel universe story which explores the idea that Neanderthals flourished in another world. At the time that the story is set, a quantum computer glitch occurs which re-unites the Neaderthals' world and our own. Very well done, very quick reading. I liked this book so much that I went out the next day and got Calculating God , another book by Sawyer. It was also excellent and I will be reading more by him in the future. Next, A Short History of Nearly Everything by Bill Bryson. Bryson is an excellent travel writer. Notice I didn't say science writer. I checked this book out of the library 6 weeks ago and still haven't finished it. It's not that it wasn't good. . . it's just that I've read much better "popular" science books. (Try Simon Singh for some really excellent books of this type.) If you want to read a great book by Bryson, pick up A Walk in the Woods or I'm a Stranger Here Myself . Blankets by Craig Thompson, was next. And I have to say that I relly loved this book! If you tried Marjane Satrapi and liked the graphic novel format, give this book a try. I sat down and read it straight through -- that's how good I thought it was. I'm sure I'll be tracking down a copy of Good-Bye, Chunky Rice , his first (I think?) book which is supposed to be somewhat of a cult classic from what I've read. Well, I guess I've been reading more than I thought because I also finished Saturday by Ian McEwan. Excellent book. I just finished it and I look forward to reading it again. This book is simply an account of one man's Saturday, but of course there is so much more to it. Many levels, quite thought provoking. Really, I think you should read it! Well, that's all the books that I have read off of my 2005 realing list. Looks like I'm going through them more quickly than I thought I would. Guess I'll have to find some more items to add. Any suggestions?